Jen Giffen, GIF-a-Day, Audio Tools, Anchor, Soundtrap, Synth, Vocaroo and more! GIF-a-Day Google Sheets Ninja Level 1 Registration! Message Jake at JakeMillerTech@gmail.com for group registration or purchase orders. Don’t forget! Apple Podcast Reviews make me smile! 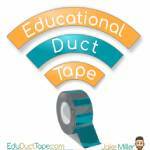 #EduDuctTape Tweets make me giddy! FlipGrid.com/EduDuctTape responses make me grin! Telling your friends makes me joyful! Today’s Guest: Jen Giffen: Jen is a Digital Literacy Consultant in Ontario, CAN. She is a Google Innovator, Sketchnoter, & co-host of #ShukesandGiff the Podcast. Former player of the game of school, she now seeks to ensure learning is authentic and relevant, especially for struggling students.